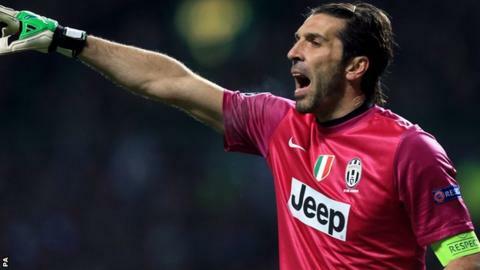 Juventus goalkeeper Gianluigi Buffon has signed a new three-year contract extension to keep him at the club beyond his 39th birthday. The 36-year-old made his Serie A debut for Parma in 1995 and has made 400 league appearances for Juve since 2001. His new deal runs until 2017. He said: "I want to continue performing to a high level, so that I can be an asset and a point of reference. "Praise from the club makes me proud of the choice I made 14 years ago." Centre-half Giorgio Chiellini, 30, has also signed a new deal until 2018. Buffon has won five Serie A titles with Juventus, plus two which were taken off the club as part of the 2006 match-fixing scandal. He won the World Cup with Italy in 2006 and remains first choice, having won a record 146 caps.